Looking for a juicing detox fast? If you've tried diet pills, packaged meals, and calorie-counting while eating the same kind of food, chances are, you're among the millions of people frustrated with not seeing results or struggling with keeping the weight off. The best, and probably the only way to win the battle against weight loss permanently, is to change your lifestyle. 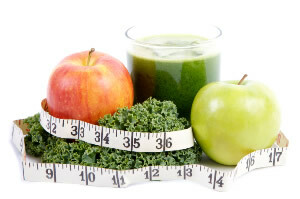 What better way to do that than kick start a healthier diet with a juicing detox. Besides rapid weight loss, detox fasting rids the body of toxins and infuses it with natural antioxidants. Basically, juicing detox fasting involves a liquid-only intake of fresh fruit and vegetable juices and water, for a short period of time. Quite obviously, juicing detox is an extreme form of dieting and as such, there are things you need to know before launching on a 24-hour detox fast. First off, don't overdo it. Juicing detox should only be from 24-72 hours. Anything longer than that should be properly supervised. Extended detoxing in this manner can cause certain deficiencies or problems in releasing too much too fast. Next, be sure you're not pregnant and don't have any chronic conditions like diabetes, epilepsy, or anemia. If you're not physically fit to begin with, you're risking making your health worse. Of course, if the fast is ordered by a qualified medical professional who is briefed on your underlying conditions, you can do so. If you're taking prescriptions or have just undergone or will undergo a surgical procedure within the past/next few weeks, it's not the time for juicing detox fasts. A juice fast reduces protein levels in the blood which can change the way medications react. Do not reduce or eliminate medications on your own; consult your doctor before doing anything drastic. Weight loss and desire for solid foods should be expected. But besides those, you may temporarily experience headaches, bad breath, hypoglycemia, tiredness, acne breakouts and even constipation. However, if you suffer from fainting, vomiting, dizziness, diarrhea, low blood pressure, kidney problems, heart arrhythmias or develop any of these conditions, stop the detox fast immediately. Diarrhea leads to dehydration and loss of electrolytes; the other side effects are serious symptoms and need to be investigated further. 1. Prepare for the detox. Reduce or eliminate alcohol, caffeine, sugar, meat, fish, dairy, wheat and eggs from your diet. Switch to more vegetables, fruits, rice and beans, preferably organic, about a week or so prior to the detox fast. 2. It’s very important that your bowels are moving regularly during any detox diet, and that means at the very least once per day, preferably two or three times. Your change in diet leading up to your fast should take care of this if it’s been a problem in the past. 3. Drink up 32-64 ounces of mixed fruit and vegetable juice throughout the day. You can typically juice celery, carrots, cucumber, watermelon (rind and all), pineapples, apples, kale, cabbage, leafy greens, etc. Many people find citrus too acidic on their stomach, and if you do drink it, one glass per day is probably good. Grapefruit and pomegranate juice are also not advisable. Grapefruit juice contains metabolic-altering compounds that affect prescription medication you ingest. Pomegranate juice appears to show similar effects. Stop consuming juice in the early evening and switch to water if you’re thirsty or want to put something in your belly. 4. Don't forget water. It's equally important to drink purified water during a juicing detox fast as you feel you need it. If available it would be best to consume alkaline water as it will help to deal with the acid toxins being released by your body. Don’t force yourself to drink, but if you’re thirsty or have a headache, then a glass of purified water might just do the trick. 5. Rest. An important component to any detox plan is rest. Your body is doing extra work during the cleanse so it is important to help out by resting and conserving your energy for detoxifying. Of course before embarking on any kind of detox diet or diet change you should consult with your personal health care provider.